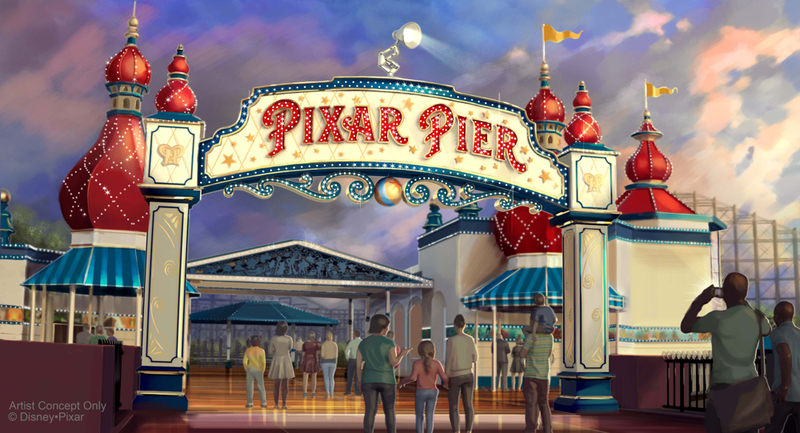 When Pixar Pier opens June 23 at Disney California Adventure park, guests will discover a new hot spot at the Lamplight Lounge. 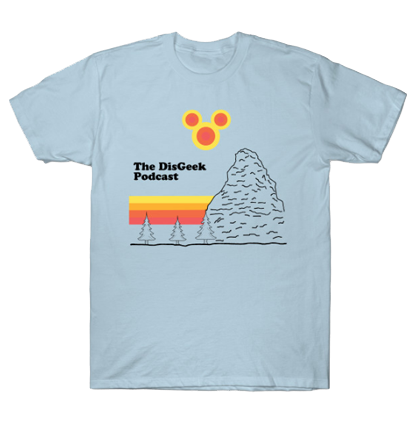 In the former location of Ariel’s Grotto and The Cove Bar, this seaside lounge will be an elegant yet fun gathering place for the whole family, located at the entrance of Pixar Pier. 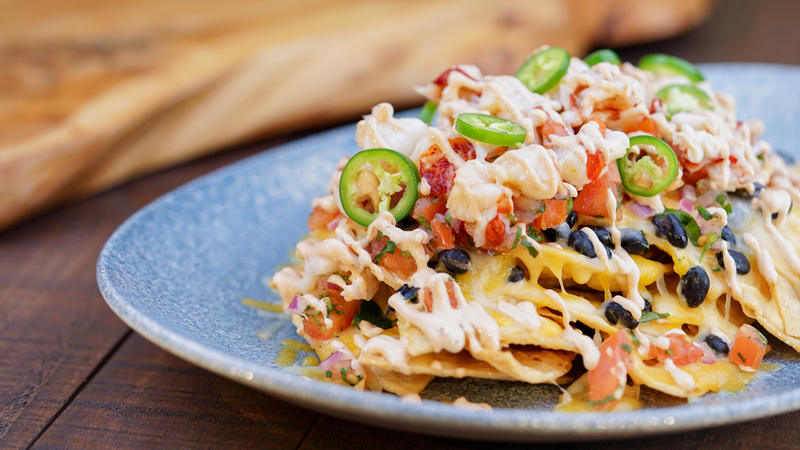 And it will continue to serve the guest-favorite Lobster Nachos. Guests wishing to visit the Cove Bar one more time are welcome to stop by as it reopens briefly beginning March 16 before closing again at the end of May for its permanent transformation. And if you can’t wait or you want your Lobster Nachos now, Disney was kind enough to release the recipe for it! Place lobster shells, carrot, celery, onion, and garlic on baking sheet with lip; coat with canola oil. Bake for 35 minutes until lightly browned. Carefully remove from oven and deglaze baking sheet with white wine. Add baking sheet ingredients with liquid to large stockpot. Add water, bay leaf, parsley, and red pepper flakes. Bring lobster stock to boil over medium-high heat, then lower to medium low heat. Let stock cook slowly until stock reduces by half, 60 to 80 minutes. Carefully strain stock, reserving 1 cup for lobster cheese sauce. Preheat frying oil to 350°F. While oil is heating, cut tortillas into 6 pie-shaped pieces. Once oil is hot, add tortillas in small batches for 2 to 4 minutes (frying times will vary). Remove from fryer once chips are lightly browned, lightly season with salt. Continue until all tortillas are fried and salted. Rinse beans in colander until water runs clear. Place beans in medium mixing bowl, mix in remaining ingredients until just combined. Mix all ingredients except serrano pepper in medium bowl. Add 1/2 serrano pepper, mix and taste; add additional serrano pepper until desired spiciness. Remove tips from garlic cloves. Add garlic to small pot and cover with canola oil. Gently poach garlic on medium-low heat until lightly browned and soft. Purée chipotle and roasted garlic in food processor. Add purée and remaining ingredients to mixing bowl and mix thoroughly. Pour crema in squeeze bottle or plastic zip bag. Lightly coat Polanco peppers with 1/2 teaspoon canola oil, place on baking sheet; roast for 15 minutes. Lightly coat shallots and garlic with remaining 1/2 teaspoon canola oil, add to Polanco peppers baking sheet; roast for an additional 25 minutes until caramelized. Purée caramelized garlic, shallots, and Polanco peppers in food processor until smooth. Melt butter in large pot over medium heat. Add flour to make a roux, stirring constantly until smooth and light golden brown, 4 to 5 minutes. Add cream and bring to boil, stirring constantly; continue to stir and cook for 10 minutes. Add reserved lobster stock and Polanco pepper purée; bring to simmer, stirring occasionally. Slowly add Oaxaca and cheddar cheeses. Stir constantly until all cheese is melted and sauce is smooth. Ensure lobster meat is cleaned and veins removed. Chop lobster in large bite-size pieces. Heat butter in large sauté pan over medium heat. Add lobster pieces, salt, pepper, lime juice, and zest to pan. Once fully cooked (145F°), remove lobster pieces with a slotted spoon. Layer with black beans, lobster cheese sauce, and mixed cheddar/jack cheese, ensuring to cover all chips. Broil until cheese is melted, watching carefully, 2 to 4 minutes. Carefully remove plate/sheet, add pico de gallo; top with lobster. Drizzle chipotle crema and garnish with sliced serrano peppers (optional). Serve immediately. CHEF’S NOTES: To cut down on preparation time, use restaurant-quality chips, pico de gallo and pre-shredded cheeses. But, if you have time, the homemade chips are the best!